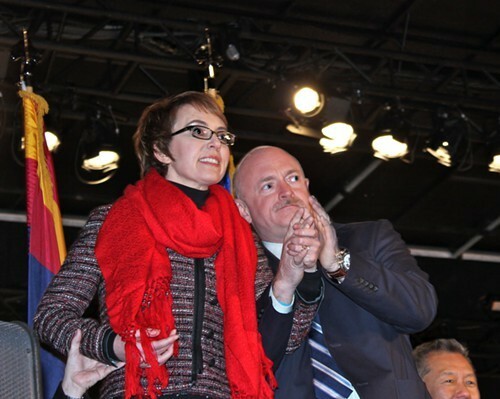 Mark Kelly: "Martha McSally May Share Gabby's Gender, But Ron Barber Shares Gabby's Values"
Gabby Giffords has found herself in the center of a minor controversy in Congressman Ron Barber’s race for reelection against GOP challenger Martha McSally. Let me tell you about Gabby Giffords. In Congress, Gabby was always straightforward with her constituents even when it wasn’t politically convenient. She was well-informed, well-read, and prepared to tackle the tough questions of the day, and she was not shy about standing up to her party's leadership. Martha McSally is no Gabby Giffords. Time and time again, she has refused to give a straight answer when asked directly about the most important issues facing Southern Arizona. When someone points out how she changed her position on an issue from August to October, McSally complains that politics isn’t fair. But when she talks to the tea party, she toes their line, spouting their policies on everything from health care to women’s rights and Social Security. Gabby and I are proud to support Ron Barber. Ron has been serving the people of this community for his entire life and in his short time in Congress he has already proven himself to be a strong voice for middle class families, seniors, veterans and women. Martha McSally may share Gabby’s gender, but Ron Barber shares Gabby’s values. This outrageous quote proves what Gabby and I have known all along - Ron must win this election.